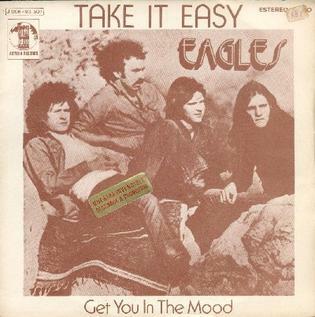 Take It Easy de Eagles faz parte do álbum "Eagles (album)" e vem com o gênero Rock,General. Foi lançado em 14 Dec 1983 sob o rótulo de Elektra Records. Direitos Autorais holded por 1976 Elektra/Asylum/Nonesuch Records..
'Take It Easy' is a song written by Jackson Browne and Glenn Frey, and most famously recorded by the Eagles (with Frey singing lead vocals). It was the band's first single, released on May 1, 1972. It also was the opening track on the band's debut album 'Eagles' and it has become one of their signature songs, included on all of their live and compilation albums. It is one of The Rock and Roll Hall of Fame's 500 Songs that Shaped Rock and Roll. Browne originally began writing 'Take It Easy' in 1971 for his own debut album. His friend and then-neighbor Frey heard an early version and liked it so much that Browne gave it to him for his new band. Frey finished the second verse (including the line 'It's a girl, my Lord, in a flatbed Ford ...') and the resulting single climbed to #12 on the U.S. Billboard Hot 100. Bass player Randy Meisner sings the harmony vocal in the beginning of this verse with Frey, but drummer Don Henley is singing harmony at the end of the verse ('Though we will never be here again...). Bernie Leadon provides the lead guitar and distinctive banjo parts, as well as harmony vocals. Jackson Browne later recorded the song as the lead track on his second album, 'For Everyman' (1973). It has also been covered by several other artists including Billy Mize, Johnny Rivers, and Travis Tritt. Tritt's version, recorded for the tribute album 'Common Thread: The Songs of the Eagles', was released as a single in 1993, and peaked at #21 on the 'Billboard' country music charts. The video for Tritt's version featured the Eagles lineup from 1978 to 1980 (precipitating the Eagles' regrouping for a new album and tour the following year). The second verse of 'Take It Easy' is set in the city of Winslow, Arizona, which responded by erecting a life-size bronze statue and mural commemorating the song, at the Standin' On The Corner Park. The statue stands leaning against a lamp post, securing an acoustic guitar between his right hand and the shoe of his right foot. Above his head, a metal sign, crafted in the style of U.S. Route shields, displays the words 'Standin' on the corner'. The trompe-l'œil mural on the wall behind the statue is that of a fake storefront, and includes what would appear to be the reflection of a red Ford pickup truck driven by a blonde-haired woman. The second floor of the mural features an eagle perched in one of the windows. thumb|340px|left|The 'Take It Easy' statue and mural at [http://maps.google.com/maps?q=35.023482,-110.69806&om=0&z=18&ll=35.023482,-110.69806&spn=0.002025,0.005364&t=k 35°1'24.54' N, 110°41'53.02' W] in Winslow, Arizona The 'corner' is actually that of North Kinsley Avenue and West 2nd Street (eastbound State Route 99) in downtown Winslow. Take It Easy Letras de músicas são propriedade dos seus respectivos artistas, escritores e etiquetas. Essas letras são fornecidas apenas para fins eduacational. Por favor, compre a música se você gosta deles.